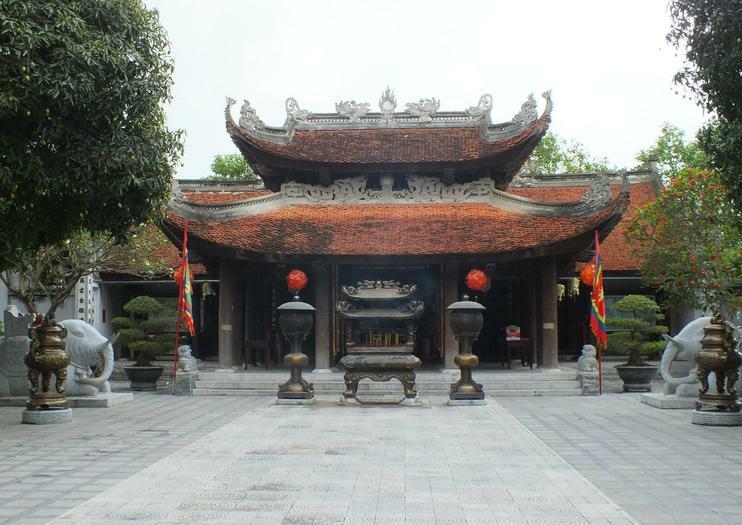 Originally constructed in the 11th century, Do Temple in Dinh Bang Village is dedicated to the deities of the eight male kings of the Ly Dynasty. Known for its beautiful architecture, the temple was destroyed in 1952 by the French, and reconstructed in 1989 according to the original layout. In front of the temple is a half-moon shaped lake, with a floating two-story pavilion used to host water puppet shows and Quan Ho folk performances. Enter the inner courtyard through the Five Dragon Gate, taking note of the Bat Trang tiles on the ground. The main hall is used to worship the eight Ly kings, while two side halls are dedicated to high-ranking civil officers and generals from the Ly Dynasty. The final, female ruler of the dynasty is worshipped at Rong (Dragon) Temple, about 1.2 miles (2 kilometers) west of Do Temple. This is an active place of worship, so visitors should be respectful of worshippers. Visitors must wear modest clothing that covers the shoulders and the knees. It’s free to enter the temple but donations are accepted. The temple is not wheelchair friendly, as there are a number of steps throughout the grounds. Do Temple is located in Dinh Bang Village, 9 miles (15 kilometers) from Hanoi. It’s easiest to take a taxi here from Hanoi. You can also it by taking bus 10 or 54 from Long Bien bus station in Hanoi. Do Temple doesn’t usually get too crowded, so it can be a good alternative when other attractions are busy. The temple will be at its most festive during its Temple Festival, which takes place from the 14th to the 16th of the third lunar month, and which attracts thousands of pilgrims and other visitors. Nearby attractions include Rong Temple; Dinh Bang Communal House, one of the largest communal houses in Vietnam; Dong Ho Painting Village, famous for its folk paintings; and Phu Lang Pottery Village, where pottery is still made using traditional methods. Swap bustling Hanoi for the Vietnamese countryside on a gentle 4-hour bike ride, departing the capital in the afternoon. Cross over the Long Bien Bridge and pedal alongside the Red River for a look at village life. You’ll taste fruit from plantations on Red River Island, learn about contemporary art at a local estate, view ceramics in the pottery village of Quang Ba, and stop at West Lake for coffee or tea at sunset. Numbers are limited to 12 people for a small-group experience with your informative guide. Enjoy this 3-day tour from Hanoi to Bac Ninh, Ninh Binh, Kenh Ga and Halong and explore the vibrant Red River Delta by bike and boat and marvel at a landscape formed by the silt-laden waters of the Red River. Discover historic pagodas of the Ly Dynasty, enjoy sunbathing and the magnificent scenery of Halong Bay and more.